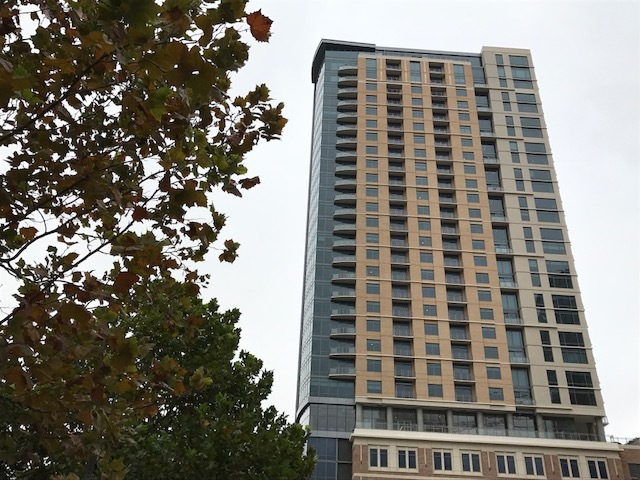 Hines recently completed a 32-story apartment tower on Travis Street in downtown Houston. Photo Credit: Ralph Bivins, Realty News Report. The 9,100-SF ground-floor restaurant space, called Bravery Chef Hall, is “an evolution of a food hall and offers fine dining with the speed of counter service,” said Hines. Ziegler Cooper Architects, working in collaboration with SJL Design Group, designed the 274-unit tower, located at 409 Travis at Preston Street, near the Market Square Park and the original Treebeard’s restaurant. The Hines apartment building, a 327,000-SF tower, has studio, one and two-bedroom units ranging in size from 570 SF up to a three-bedroom 2,227-SF penthouse. The restaurant space on the first floor of the building is a new concept. “Bravery Chef Hall will be a one-of-a-kind amenity for residents of Aris Market Square,” said David Haltom, Director at Hines. 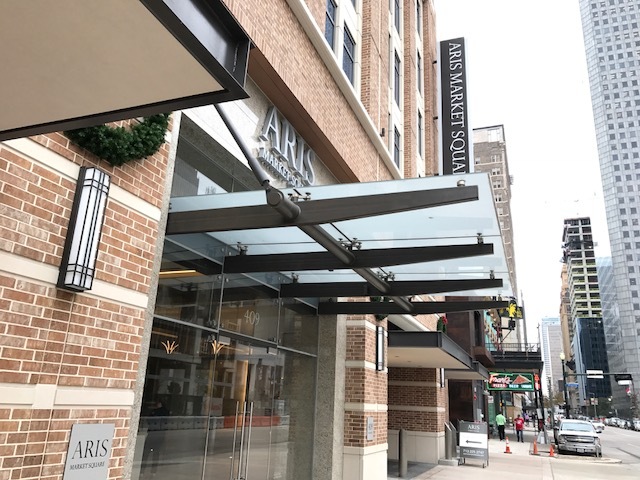 The new Aris Market Square faces Travis Street in downtown. Photo Credit: Ralph Bivins, Realty News Report. Bravery Chef Hall will feature five open-kitchen stations owned and operated by chefs, each with its own dining concept. Stations will accommodate between 30 and 40 guests in a counter-side seating format centered around the chef. Each station also caters to casual diners offering a walk-up area to order and find table seating within the hall, or order to-go. Anh Mai and Lian Nguyen, the same duo who introduced Houston’s first food hall, Conservatory – Underground Beer Garden & Food Hall, are the creators of Bravery Chef Hall. Managed by veteran restaurateur and sommelier Shepard Ross, Bravery Chef Hall will feature kitchens by David Guerrero of Andes Café, Ben McPherson formerly of Krisp Bird & Batter, Gary Ly, formerly of Underbelly and two chefs to be announced. In addition to the five stations, the chef hall will include two separate wine bars and one coffee and pastry counter.